Archbishop Fulton Sheen pointed out that it seems that there is a crisis about every five hundred years in the history of Christendom. The first cycle of five hundred years was the fall of Rome, and God raised up Pope Gregory the Great to set about conversion of the barbarians and prepared the way for a Christian Europe. At the end of the second cycle, around the year 1000, there was the Eastern schism and the decline of the holiness in the Church. Gregory VII reformed the Church and prepared the way for the great medieval civilization. In the third cycle of the five hundred years, there was the Protestant revolt. Pope Pius V applied the reforms of the Council of Trent and established missionary activities throughout the world. Before becoming Pope John Paul II, Karol Wojtyla attended the Second Vatican Council (1962-1965) as a bishop. The Council was convoked by Pope John XXIII as a means to make the Church more effective in her ministry to the modern world. Vatican II encouraged greater participation of the laity in the life of the Church and stirred the consciences of all Christians to work for unity and peace. The Council also opened the Scriptures more fully for the faithful in the liturgy and brought the liturgies closer to the people. Pope John Paul II was a true mystic who affirmed the dignity of the human person. He brought out clearly the message of the universal call to holiness. He proposed numerous saints and blessed as examples of authentic Christian living. As a pastoral pope, John Paul II loved the people intensely and reached out to all people as their father and pastor. Another saintly figure of the 20th century is Blessed Teresa of Calcutta. Like John Paul II, she was a mystic who affirmed the dignity of the human person. Desiring to satiate the thirst of Jesus Christ on the cross for love and for souls, Mother Teresa founded the Missionaries of Charity in 1950. Both John Paul II and Mother Teresa were intensely devoted to Jesus in the Holy Eucharist and the Immaculate Heart of Mary. Their words and examples help us to translate the teachings of Vatican II into actions, and equip the Church to face the great challenges of the 21st century. These challenges include: the question of Islam, the new evangelization in formerly Christian regions, the continuing crisis of dissent with widespread ignorance of the Catholic teachings among the faithful, and the culture of death against the traditional values of family, marriage and life. This article concludes the series of twenty-six articles on Church History. These articles can be viewed on my personal site: http://www.fatheranthonyho.com. This entry was posted in Church History on June 23, 2013 by fatheranthonyho. On July 13, 1917 the three children of Fatima saw a vision regarding the persecutions during the 20th century. During the 20th century there were persecutions in Asia, Africa, Central and South America, the Middle East and Europe. Between 1931 and 1939 Spain experienced the greatest Christian mass slaughter since the times of the Roman Empire. During World War II, the Nazi regime fiercely persecuted the Church. After World War II, Communist persecutions had become systematic in Eastern Europe. Blessed John Paul II said, “Countless numbers refused to yield to the cult of the false gods of the 20th century and were sacrificed by Communism, Nazism, by the idolatry of State or race”. On May 13, 1981 John Paul II (the bishop dressed in white) was shot at St. Peter’s Square. After the assassination attempt, it was clear to John Paul II that “it was a mother’s hand that guided the bullet’s path and in his throes the Pope halted at the threshold of death”. The Church keeps alive the memory of martyrs especially through canonizations and beatifications. Two of the most famous martyrs canonized by John Paul II are St. Maximilian Kolbe (1894-1941) and St. Teresa Benedicta of the Cross or Edith Stein (1891-1942). St. Maximilian was a great devotee of Our Lady. He founded the Militia of Mary Immaculate, started a Marian magazine, and established an international center of Marian devotion. During World War II, St. Maximilian was arrested by the Nazi. At the concentration camp, in reprisal for one prisoner’s escape, ten men were chosen to die. Father Kolbe offered himself in place of a young husband and father. He died a martyr of charity on August 14, 1941. Edith Stein was a philosopher who converted to the Catholic Faith after reading the autobiography of St. Teresa of Avila. She became a Carmelite nun and lived a life of prayer, fasting, and penance. In 1942 she was arrested by the Nazi and was killed in the gas chamber on August 9. Our Lady appeared at different places in the 20th century, asking for prayer for the conversion of sinners, and promising to intercede for suffering humanity. In 1917, Our Lady appeared six times to three children at Fatima, Portugal. The three children were: Lucia Santos, Francisco Marto and Jacinta Marto. One of the key messages of Fatima is devotion to the Immaculate Heart of Mary as an effective means for the salvation of souls and peace of the world. From November 29, 1932 to January 3, 1933, Our Lady appeared thirty-three times to five children at Beauraing, Belgium. Our Lady said, “Pray, pray very much.”She also requested that a chapel be built and that people would come in pilgrimage. Our Lady indicated herself as “the Immaculate Virgin”. Twelve days after the last apparition at Beauraing, Our Lady appeared at Banneux, Belgium. Banneux is fifty miles from Beauraing. Our Lady appeared to an eleven years old girl, Mariette Beco, eight times from January 15 to March 2, 1933. Between 1981 and 1989 Our Lady appeared to three young women (Alphonsine, Nathalie & Marie Claire) who were attending a Catholic school in Kibeho, Rwanda. Though there were other people who claimed to experience apparitions, the Church only approved the Marian apparitions that were received by the three young women at the Catholic school. Nathalie is especially known for the message of redemptive suffering and unceasing prayer for a world that is very bad and at risk of falling into an abyss. In 1982 the girls foresaw the genocide that would take place in 1994. This entry was posted in Church History on June 13, 2013 by fatheranthonyho. In the nineteenth century, while the Church was being rebuilt in France, a number of Marian apparitions there helped to shape the spiritual life of the faithful. St. Catherine Laboure was a religious at Paris. On the night of July 18, 1830 a “shining child” woke her up, and led her to the chapel. Our Lady appeared and talked with her for two hours. St. Catherine was told about her future mission and the difficult times to come. On November 27, Our Lady appeared again in the same chapel, standing on a globe with shafts of light streaming from her hands towards it, surrounded by the words: “O Mary conceived without sin, pray for us who have recourse to thee!” Then the vision turned about, and St. Catherine saw a capital “M” with a cross above it and two hearts beneath it. One heart was thorn-crowned and the other pierced with a sword. St. Catherine heard a voice telling her to have a medal struck according to the visions and promising great graces to those who would wear it with devotion. The medal was called “Miraculous medal”. Numerous graces, including healing and conversion, have been obtained through the wearing of the medal. On September 8, 1840, Our Lady appeared to Sister Justine Bisqueyburo, a religious who belonged to the same convent of St. Catherine Labourse. 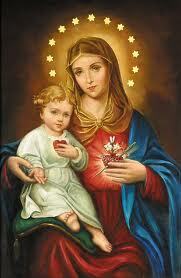 Mary appeared holding in her right hand her Immaculate Heart and holding in her left hand a scapular. An interior voice revealed to Sister Justine that Mary wanted copies of the scapular made as soon as possible and distributed with great confidence. On September 8, 1846, Our Lady appeared again, and let Sister Justine knew that the green scapular is not like others (it is not the clothing-habit of a confraternity) but merely two holy pictures on a single piece of material. It is to be blessed by a priest and worn by the one whom we desire to benefit by Our Lady’s intercession. If a person is unable or even unwilling to wear or carry it, it may even be slipped, unknown to the person, into his clothes, bed, room, or possessions. A prayer should be said at least once a day: “Immaculate heart of Mary, pray for us now and at the hour of our death.” If the person who is the intended beneficiary of the scapular’s use does not say it, then someone else can say it in his place. The graces obtained through the green scapular are more or less great in proportion to the degree of confidence of the person praying. Numerous miracles of healing and conversion have occurred by means of the Green Scapular. In 1854, Pope Pius IX defined the dogma of the Immaculate Conception of the Blessed Virgin Mary. Four years later in 1858, Our Lady appeared eighteen times to St. Bernadette Soubirous in the recess of the Massabielle cliff near Lourdes from February 11 to July 16. Our Lady instructed Bernadette to drink and wash at the spring of the cave. She also requested prayers for sinners, penance, processions, and a chapel built. In modern time, many people exalted reason to the point of excluding faith; they relied on self rather than God. In the meanwhile God raised up saints who gave powerful examples of trustful reliance on God. St. John Bosco (1815-1888), St. Joseph Cottolengo (1786-1842), St. Luigi Guanella (1842-1915) and St. Louis Orione (1872-1940) were saints in northern Italy who founded religious congregations and helped numerous people with great reliance on Divine Providence. St. Joseph Cottolengo was a friend of Don Bosco. St. Luigi Guanella stayed with Don Bosco for three years, and St. Louis Orione was a favorite student of Don Bosco. These saints, with charismatic reliance on Divine Providence, responded to the needs of the time, and founded religious institutes which still exist today. Cottolengo convinced his religious that they would continue to do wonderful things if they responded promptly and trustfully to the impulses from above. St. Faustina Kowalska (1905-1938) of Poland was an apostle of Divine Mercy. She entered the convent around twenty, and in the 1930’s received private revelations from Christ regarding devotion to Divine Mercy. This entry was posted in Church History on May 27, 2013 by fatheranthonyho. The nineteenth century saw the revival of the Catholic Church in France, Germany, Ireland, and England. During that period the Church was blessed by the life of Blessed Frederick Ozanam (1813-1853) in France, and by the lives of Blessed Dominic Barberi (1792-1849) and Blessed John Henry Newman (1801-1890) in England. At the Royal College of Lyons, the young Frederick Ozanam and his fellow students organized conferences of literature, history, and philosophy to support one another in the faith. During one of the conferences, a young socialist challenged Frederick saying, “The Church is hypocrisy. What are you doing for the poor?” This conversation led to the establishment of the Conference of Charity, which eventually became the Society of St. Vincent de Paul. Before his death at forty, Frederick pioneered the newspaper, The New Era, to secure justice for the poor and the working class. He also oversaw the expansion of the Society to other countries. Today, the Society of St. Vincent de Paul is an international organization with over one million members helping thirty million poor people daily. An orphan at eight, Dominic was raised up by his uncle and aunt. When Napoleon closed all the religious houses in Italy, Dominic became acquainted with several Passionist living in exile near his town. During this time, he experienced an interior call to preach to the people in England. Dominic joined the Passionist and was ordained a priest in 1821. He ministered in Italy for nineteen years, but his heart was in England. He learnt English and met with English visitors in Rome. In 1840, Dominic and his companions established the first Passionist monastery outside of Italy in Belgium. Finally in 1842, he established the first Passionist house in England. In his short seven years in England, Dominic worked tirelessly as a home-missioner. He established three churches and several chapels, preached numerous missions and received hundreds of converts, including John Henry Newman, into the Catholic Church. Since the Protestant revolt, the freedom of Catholics in England had been restricted. The Act of Catholic Emancipation signed by the king on April 13, 1829 permitted Catholics in England to worship publicly. The Oxford Movement (1833-1845) represented growing interest in the Catholic Church in the Protestant University of Oxford. John Henry Newman was the most famous convert to Catholicism in the Oxford Movement. He entered the Catholic Church in 1845 and was ordained a priest in Rome the next year. He came back to England and established the Oratory of St. Philip near Birmingham in 1848. As a Catholic priest, John Henry Newman wrote Parochial and Plain Sermons, An Essay in Aid of a Grammar of Assent (a treatise on the philosophy of religion), and Apologia Pro Vita Sua ( the classic defense of his religious views). On May 12, 1879, John Henry Newman was made Cardinal by Pope Leo XIII. During his trip to England, Pope Benedict XVI beatified John Henry Newman on September 19, 2010. On November 4, 2009, Benedict XVI issued the apostolic constitution, Anglicanorum Coetibus, enabling Anglicans to enter into full communion with the Catholic Church while preserving elements of their distinctive Anglican spiritual and liturgical heritage. In accordance with Anglicanorum Coetibus, the Personal Ordinariate of Our Lady of Walsingham was established on January 15, 2011 under the patronage of Blessed John Henry Newman. This entry was posted in Church History on May 18, 2013 by fatheranthonyho. During the French Revolution, heroic men and women preserved the Catholic Faith with great fidelity. After the revolution, the Church in France was rebuilt by dedicated clergy and faithful. Some of the heroes of that period include St. Julie (Juila) Billiart (1751-1816), St. Mary Magdalen Postel (1756-1846), and St. Eugene De Mazenod (1782-1861). As a young girl, playing “school” was Julie Billiart’s favorite game. At 14, Julie dedicated herself to God by a vow of chastity, and at 16 she started to teach in order to support her family. On the winter of 1774, a robber attempted to murder Julie’s father by discharging a pistol into the house. This event shocked the nervous system of Julie badly and she suffered thirty years of poor health. Julie was paralyzed for twenty-two years. During the French Revolution, Julie offered her home as a hiding place for loyal priests. Hence, five times in three years she was forced to flee in secret. One day, Julie had a vision. She saw the Crucified Lord surrounded by a large group of religious women dressed in a habit she had never seen. Julie was told by an inner voice that these religious would be her daughters and that she would start an institute for the education of young girls. In 1803, Julie laid the foundation of the Sisters of Notre Dame and lived in community with a few companions. In 1804, Julie was asked by a priest to pray a Novena. During the Novena, on the Feast of the Sacred Heart, the priest said, “Mother, if you have any faith, take one step in honor of the Sacred Heart.” Julie got up and was cured from her paralyzation. On October 15, 1804, Julie and her companions took the first vows in the new Congregation of Sisters of Notre Dame. Julie was elected as Mother General of the new congregation. At 18, Mary Magdalen Postel took the vow of chastity and opened a school for the girls at Barfluer. The school was closed by the revolutionaries during the French Revolution. Mary Magdalen became a leader in Barfluer for loyal Catholics. She sheltered loyal priests in her home, and was authorized to keep the Blessed Sacrament at her home and to minister Viaticum to the dying. In 1801, the Concordat between Napoleon and the Vatican allowed freedom of religion for French Catholics. Mary Magdalen was able to teach religion openly. She and three other teachers took religious vows in 1807 and started the Sisters of Christian Schools of Mercy. Eugene De Mazenod was the offspring of noble family in southern France. During the revolution, he spent some years in exile in Italy. He entered the seminary at 26. As a priest, Eugene directed his ministry to the poor. Other priests joined him to labor for the poor, and formed a community for the works of the missions and direction of seminaries. The community eventually became the Oblates of Mary Immaculate. In 1832, Eugene was consecrated bishop. He became the Bishop of Marseilles in 1837. As Bishop, Eugene built churches, founded parishes, cared for his priests, and developed catechetics for the young.